By now you may be thinking that registering your website with the search engines by hand is going to be a lot of work. It is. In my experience, it is about as difficult as doing your first college term paper. In case you didn't go to college--your first college term paper can seem very difficult. The second or third time you do a term paper it isn't as difficult, but it is still time consuming and bothersome. And no matter how many times you do one, it won't ever get to a point where you'll call it easy or fun. Challenging? Yes. Fun? Not really. Search engine registrations are quite a bit like that. When we do search engine registrations, we make sure each registration is done right, by hand, at each search engine and directory. 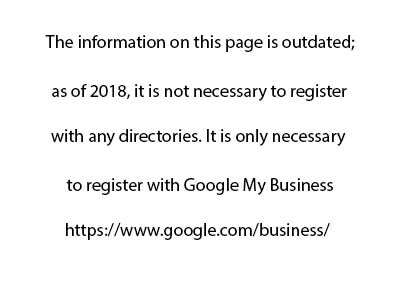 If this is your first time doing a search engine registration, it will take you many hours (possibly several days) to plod on through this list of directories and search engines, registering as you go. Many of our clients have found it is cheaper to pay us to do this for them than it is to have an employee do it. After all, this is a special skill that may only be needed this one time. Is it really worth your time to learn all there is to know about search engine registrations so you can be sure it is done right the first time? If it is, then by all means use this free page--that's what it is for. If you're on a tight budget, then have at it yourself. I've tried to include everything you need to know. But if you're ready to contact us about doing this for you, click here. Also note: If we do it for you, you get a free BONUS REPORT of exactly what we do at each search engine and directory. We also tell you if your site was already listed. And how it ranked for your main key word phrase, if it was already listed. We also tell you when you can expect to see results from that search engine. This provides a very good baseline report of your rankings at the main search engines and directories, for future comparisons. Our registration charge DOES NOT include the hard costs of registering at some of the search engines -- such as the fee of $299 that Yahoo! charges to register. Those hard costs need to go on a company credit card or one belonging to a principal of your company.